The Safeway (NYSE: SWY) headquarters are located in Pleasanton, California, and their stable of stores comes in fifth place among grocery retailers in the U.S., with Walmart coming in as number one. Safeway controls more than 1,516 stores located in the U.S. and more than 200 stores in Canada. More than half of the 1,500 stores in the U.S. are in the western half of the country, with 34% in California alone: the other percentage is spread between 20 other states. To support its stores in the U.S. and Canada, Safeway operates a widespread network of 17 distribution centers (DCs). In addition, they control 32 food processing and manufacturing facilities. Safeway also has 49% concern in Casa Ley. They are a retailer in Western Mexico with 161 stores. In fiscal year ending January 2010 (the last year for which data is available), Safeway had a total U.S. sales of $34.98 billion. Food related sales contributed 90% of that with $31.5 billion. Safeway operates under 10 different store names, nearly each one specific to the area it serves. Only Safeway Food and Drug are in more then one market. 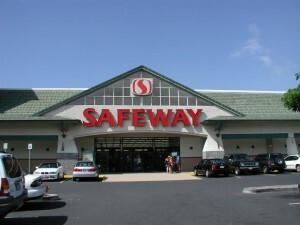 Safeway Food and Drug – Arizona, Colorado, DC, Delaware, Idaho, Hawaii, Maryland, Montana, California, Nebraska, New Mexico, Nevada, Oregon, South Dakota, Washington, Virginia, and Wyoming. Many Safeway stores include gas stations. By using their customer club card or telephone number, customers receive a discount on gas purchases. Eating Right: a line aimed at healthier eating with labels for low fat, low sodium, etc. The Safeway name was the result of contest held in 1925 and it denoted the cash-and-carry basis of the store. At that time, many stores offered credit to patrons, leaving them in debt. The cash-and-carry, the ‘safe way’ to buy groceries. Starbucks at Safeway has great service and is a great place to get coffee.